The year is 2154. Earth is polluted, diseased, and overpopulated. The richest citizens have created a safe haven on which to live that orbits the Earth. They call it Elysium. In addition to be a tightly guarded utopia, they have all kinds of high-tech equipment there, including machines that can quickly repair any medical problems. The poorest are left to live in the wasteland that Earth has become. The citizens of Elysium want nothing to do with these pariah, and any attempt by the Earthlings to get to Elysium are met with swift consequences by the ironfisted Secretary of Defense, Delacourt (Jodie Foster). She is in control of Elysium’s defenses, as well as Earth’s Draconian robot police force used to keep the Earthlings in check. Max De Costa (Matt Damon) has had his share of run ins with the police force since he was a kid. He currently works at Armadyne, a factory where the robots are built. After a malfunction, he is exposed to a lethal dose of radiation. He is given pills that will keep him functioning until his inevitable death in 5 days. Max’s only hope is to make a deal with Spider (Wagner Moura), who runs an operation that tries to smuggle Earthlings to Elysium. If Max can get to one of the Med-Bays, he can save himself. Max’s part of the deal is to steal financial information from the digital drive inside Armadyne CEO, John Carlyle’ (William Fichtner) brain. What they steal is much more valuable than they had planned. It is also much more dangerous for Max to possess. If he can reach Elysium, the balance of power could be shifted. As with all dystopian sci-fi movies, the Earth is now a wasteland. And the action takes place in Los Angeles. Apparently, LA becomes the only city left in the world. Despite its lack of heavy sci-fi action, it has enough to serve its purpose. Visually, the film is well done. You won’t find any groundbreaking effects or visuals. Which works for the movie. What you get is a (mostly) believable Earth that has been devastated by humans. It definitely fits the tone of the film. Matt Damon is basically a futuristic Jason Bourne, fitted with a mechanical exoskeleton to aid his weak body. His previous run ins with the law are there to give his character some depth, as well as to give some legitimacy to not only his dislike of the police force, but his ability to fight. Again, it works for the movie. I found Jodie Foster less believable as the Secretary of Defense. She tries to carry off a tougher Hilary Clinton like persona. It doesn’t really take. I feel they could have made a better casting choice here. Everyone else in the film is more or less disposable. They could have put anyone in those roles. There are definitely some heavy politics motifs running through the movie, specifically when it comes to the upper class vs. lower class dynamic. It is obvious enough that you can’t ignore it, but it doesn’t get overly preachy. And it isn’t too far off the mark, as far as where we could potentially find ourselves in 140 years or so. 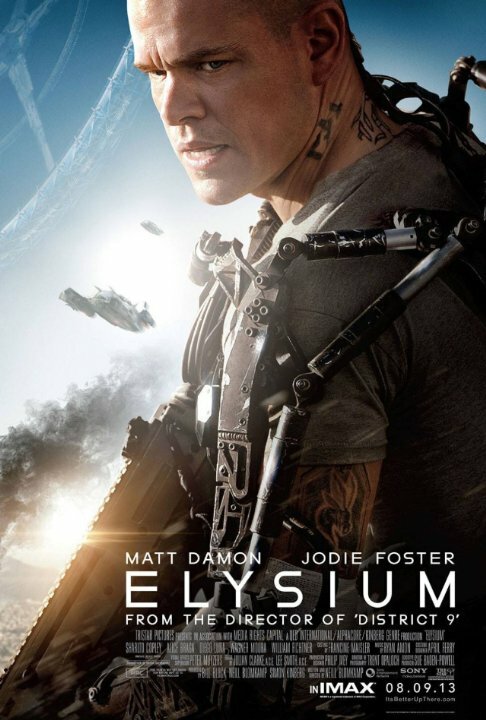 Overall, Elysium isn’t what I would consider a great film. And the set up does remind me a bit of Wall-E. But it definitely isn’t a bad film, as far as the genre goes. It is worth picking up at the RedBox if you have a free evening.